At Budget Blinds of Monterey Bay, we're your local neighborhood experts that truly understand your needs. We're in your neighborhood, we know the local Monterey Bay weather and community, and we’re backed by the #1 provider of blinds, shades, and drapes in North America. Over 25 years of customer satisfaction gives you peace of mind that only comes with choosing the proven leader. We bring the showroom to you in Monterey Bay. We expertly measure your space, install beautiful window treatments, and back it up with the best warranty in the business so you can sit back and relax in the beautiful, Monterey Bay weather and sunshine. We serve to give you the best in window treatments, so you can rest easy knowing your space will be beautified and optimized with window treatments that fit your individual needs. When it comes to sourcing stylish, premium window fashions in and around our beautiful Wine Country we know how challenging it can be. You’re “crazy busy” schedule can get in the way, but relax because Budget Blinds serving San Benito County and the Central Coast is here for you. Our vast experience, personalized design approach, and “uber” passion for creating the perfect look in your home will induce compliments from friends and family year after year. 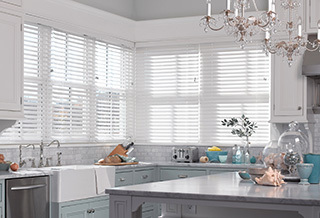 We’re locally based and family-owned, so from Pacific Grove to Del Rey Oak, we lead local with trend-forward styles, fabrics, and colors in innovative blinds, shades, shutters and drapery. We can even find the perfect window treatment for those awkward sized windows. Yes, you might say Budget Blinds serving San Benito County and the Central Coast has you covered…and then some. Why not reward yourself with new, custom window treatments that reflect your own unique sense of style? We’ll even make it fun and easy with our FREE in-home design consultation, which is by itself a remarkable value. Call or click today and see why from PCH to Laguna Grande Park and beyond, Budget Blinds is the preferred choice by so many homeowners. I would like everyone to know that Phil Wilson did a great job at our blind installation...was efficient and effective and the blinds work wonderfully.We could not be more pleased and look forward to doing business with him again. Great service. Love the fact that there are so many style & fabric choices. Phil knows his products and as always steered us in the right direction to meet our needs. Highly recommend Budget Blinds-Central Coast, they are a five star company.